Beef jerky original and Saltyplums.com has been working hard to deliver value for money and with the recent price rise we were having trouble delivering a 1kg bag under $46 then we discovered if we get our bags packed at 950 grams (basically remove approximately 11 salty plums) we can deliver a 1kg resealable bag to our customers for just $44 bucks. To be clear there are only approximately 950 grams of salty plums in this package. The reason for this is so that we can use different size post bags. Enjoying product , I will have to try the "extra salty" plums as these are just slightly to bitter for me and the colouring on the mouth and lips are a bit bright ! But overall good quality products with good delivery time , thanks will shop again ! 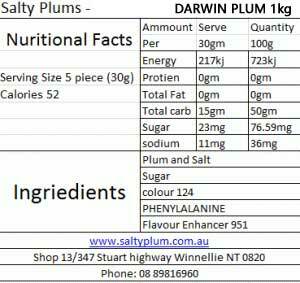 Best salty plums i have ever tasted here in Australia will definetly be ordering more. Not the same as when I grew up in GOVE/NHULUNBUY but absolutely fantastic closest flavour I've come across. Bloody beautiful guys, will be ordering more for sure thanks you. The best salty plums I’ve had. I order a bag every time I run out. Sooo addictive!